This quick and easy pizza pot pie is perfect for weeknights. Made with simple ingredients it's full of flavor and a sure family favorite! ½ cup finely diced onion I like to use frozen diced onion so that I don't have to chop it! ½ cup mini pepperoni I just use mini pepperoni so that I don't even have to chop them, but regular diced pepperoni works fine too! Brown ground beef, pepper, and onion in a large skillet over medium-high heat until no longer pink. Drain. Add marinara and pepperoni to the skillet; stir to combine. Pour into 9-inch x 13-inch baking dish. Top with shredded cheese. Separate the dough into 10 mini biscuits. Place biscuits evenly on top of the cheese. Bake at 350F (180C) for 25-30 minutes, or until biscuits are golden brown and cooked through. Check on the casserole about halfway through the baking time. 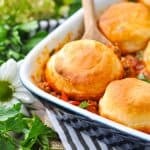 If the biscuits start to get too brown before they are completely cooked through, just cover the casserole with foil and continue to bake (covered) until done. *I like to use the mini biscuits because they cook faster, and that way you don't have biscuits that get too dark on top but are still raw in the center when the baking time is done. If you use the larger biscuits, just be sure to cover the casserole with foil about halfway through baking so that the biscuits don't get burned on top. You might also need to add some extra cooking time to make sure that the larger biscuits are cooked through. Cooking Just for Two? You can cut this recipe in half! Just use 1/2 lb. of beef, 1 can of mini biscuits, and cut all of the other ingredients in half as well. Bake the casserole in an 8-inch square baking pan. The cooking instructions remain the same.